Wow, Anja! I am impressed! You did an amazing job on your FMQ. Fabulous! That looks fabulous! Love your FMQ. Thanks for hosting! My goodness! You have been busy and productive lately! 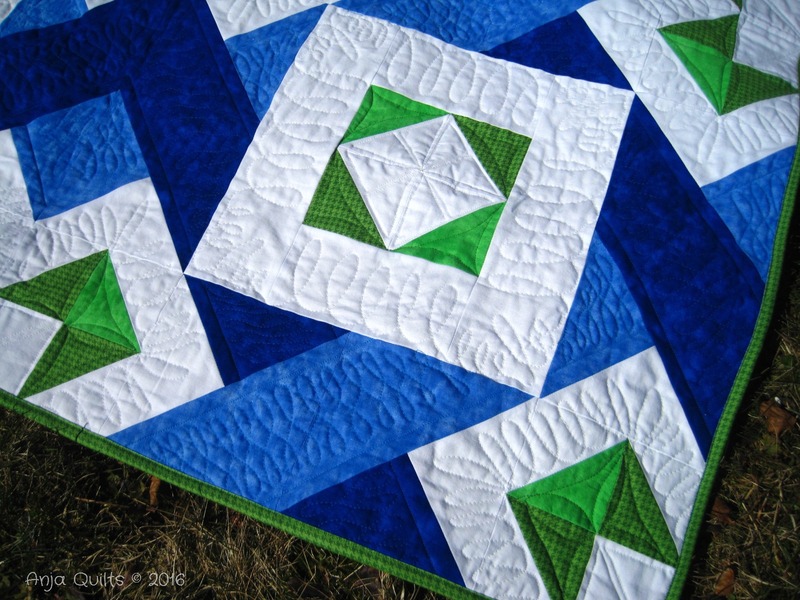 Your FMQ motifs are great! They look really good, Anja! I really like what you did in the white squares. Gorgeous! Your free motion looks great! I love how you quilted this. You should be very proud from the fabrics you chose to the quilting motifs. Corners always make me scratch my head too. I always just stumble through them till I can see a straight path again. I think your FMQ is great. You're being too hard on yourself! Love the colors, great finish! Thank you for hosting TGIFF this week! You did a great job on this quilt. From the colors to the quilting! I'm still fighting with FMQ myself, so I know what a challenge it can be! Love this! I think your fmq is better than you give it credit for. I think I've heard the F shape called a wishbone? Anyway, it looked great on your quilt and combined with the other loops. I love the colors in your quilt, and your free motion quilting is great! Well done!! Simply beautiful! You picked some great colors that worked great with that pattern. 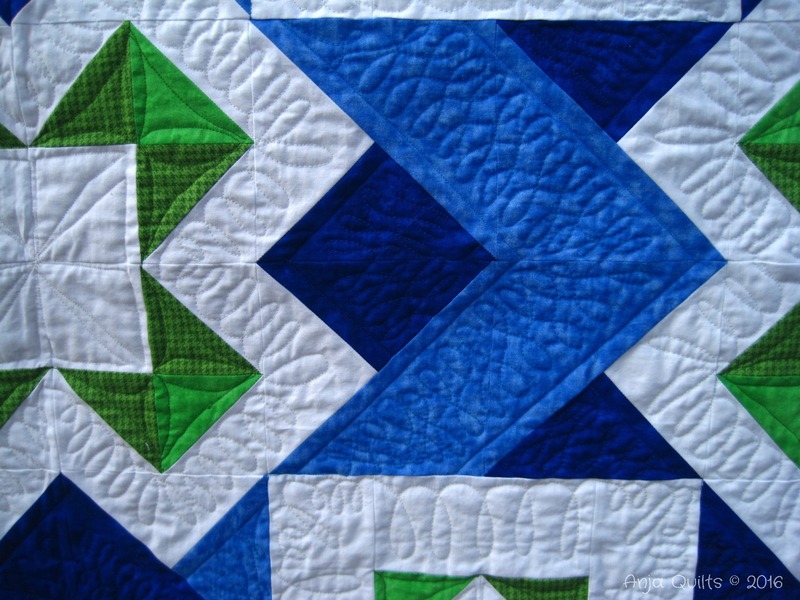 Don't be so hard on yourself for your quilting. I think it looks wonderful! Looks brill. congrats on a beautiful finish! Such pretty colors - a lovely finish! The "L" shape is fabulous! Awesome colors, too! Congrats on a great finish! That quilt is awesome. I love your choice of colours, and the pattern is so intricate. Lots to see in that quilt. Great finish. 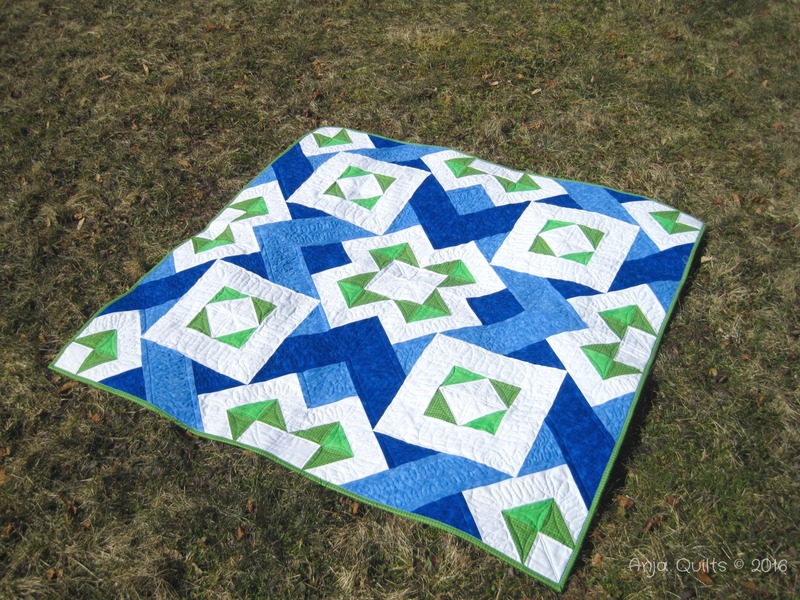 Great job on that free motion quilting sister! We just keep getting better and better and one day we will be awesome! Your quilt really pops in your photos. I think you hit the sweet spot for the lighting! The quilt is beautiful, especially in the photo in the second spot! You really did hit on some great lighting there. And your FMQ is coming along nicely - lots of practice will help! Whoop whoop for you!! I love the different motifs you quilted! I'm going to have to remember the one you used in the square, it's perfect for my current WIP! Thanks for hosting! It's a stunning quilt and I think your quilting adds to it. Beautifully done! 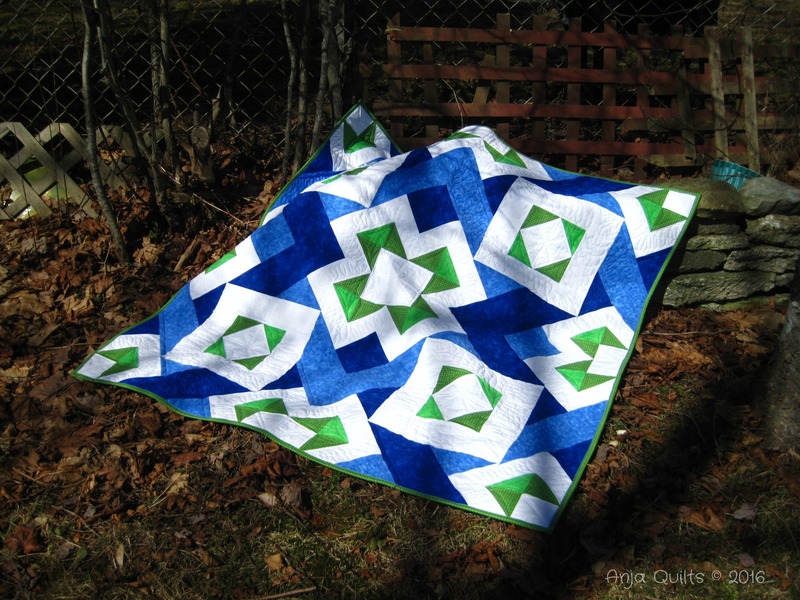 I'm so excited to see you experimenting with different FMQ motifs! What a gorgeous finish, Anja. Lovely work! Beautiful finish, Anja! I love those colors and your pretty FMQ. Did you like changing thread colors? For your quilt it was definitely worth the extra time. The quilt is gorgeous! 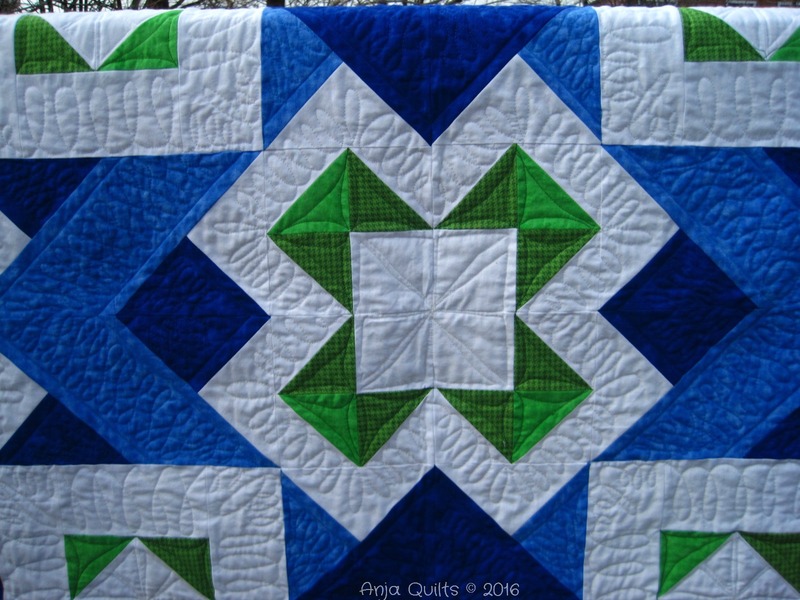 Your quilting is great!! Beautiful finish! Love your blue and green combo Anja! And congrats on the quilting! Great job! Thank you for talking about the different designs and how you approached them. Very very nice. I'm clicking to follow you by email! Yay Anja! You did really good!!! Keep up the good work. So lovely!! Your quilting is amazing. Thanks so much for participating in the Finish-A-Long, on behalf of the 2016 hosts!